A new brew fit for a king debuts just in time for you to enjoy it in your own castle while watching Season 3 of Game of Thrones. 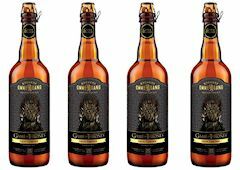 Brewery Ommegang and HBO are partnering on a series of beers inspired by Game of Thrones. Launching in conjunction with the season three debut on March 31, Iron Throne, a Blonde Ale, is the inaugural beer in the series and the result of a creative collaboration between Brewmaster Phil Leinhart and HBO. Ommegang and HBO is focused on developing unique beers that are named and crafted to directly tie into themes and nuances of the medieval-like fantasy realm of Westeros and the surrounding kingdoms. Help us toast Season 3 of HBO’s Game of Thrones and wish a Happy 2013 to all the followers of our Song of Ice and Fire.